WOW! 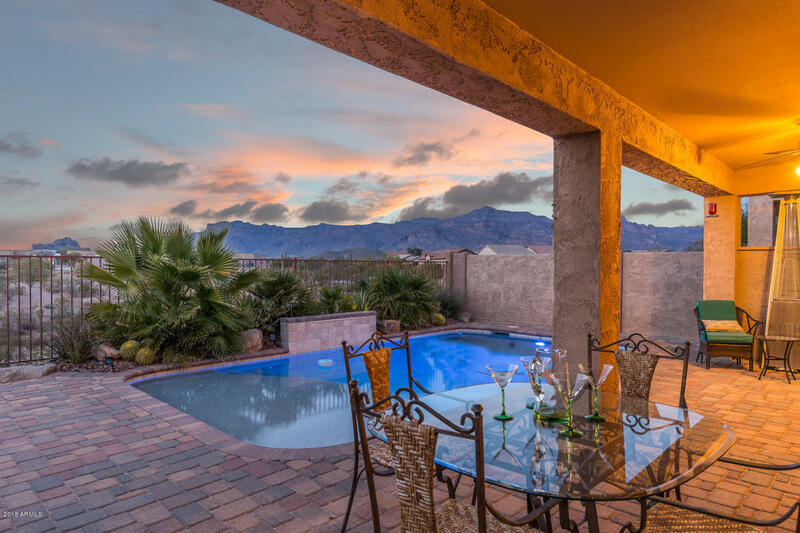 *** STUNNING SUPERSTITION MOUNTAIN VIEWS from your HEATED PEBBLE TECH POOL and generous expanded PAVER PATIO with MULTIPLE SEATING AREAS.... in the sought after GATED COMMUNITY of Peralta Trails with access to the Heated Community Pool and Recreation Center with Exercise facilities too! You'll love the TASTEFUL DECOR and GREAT ROOM FLOOR PLAN with TILE FLOORING in all the main living areas, IMPRESSIVE PLANTATION SHUTTERS, cozy gas fireplaces, STAINLESS STEEL APPLIANCES, pull-out shelves, pantry and so much more. Skip the hassle of paying movers or spending hours upon hours furnishing the home and start enjoying the FABULOUS GOLD CANYON LIFESTYLE! Treat yourself...CALL!